Yes it’s a twisted concept: bacon crust pizza. Or maybe a woven concept. Bacon as the crust of a pizza? Is it really necessary? This came about in the search for low carb pizza options like the BBQ Cauliflower pizza here. The trick with a bacon crust -or any bacon – on a grill is avoiding flare ups. Go low and slow. We used a Traeger pellet cooker for the bacon and always recommend using smoke and indirect low heat for bacon. In the home, a lot of people will now cook bacon in the oven instead of a skillet for similar reasons. For low carb pizza fans. Or high bacon fans. 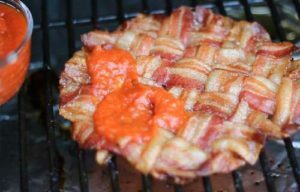 The key to using bacon crust is in the weave. Weave bacon on parchment paper for easy handling. Use chilled or refrigerated bacon for easy handling. Cut bacon weave square into a round using a second – cover- sheet of parchment and a medium to large bowl. Reserve trimmed bacon. Chop ¼ red onion and sautee with chopped remaining bacon until caramelized. Smoke bacon weave in smoker at 350 degrees F for an hour. Top bacon crust with additional ingredients. One initial thin bottom layer of cheese helps to minimize leaks and softness. Add fresh basil at end of cook. Top bacon crust with additional ingredients. One initial thin bottom layer of cheese helps to minimize leaks and softness. Add fresh basil at end of cook. Allow 10 minutes to rest and allow bottom layer to firm up before serving.